This spring, trout and trout anglers have benefited from abundant rainfall and cool weather conditions that promote the growth and survival of trout and salmon. However, with the forecast for high temperatures this weekend through next week, it is important to remember that trout and salmon are coldwater sportfish that can experience serious physical stress whenever water temperatures climb above 70° Fahrenheit. Heat stressed fish often seek pockets of cold water created by upwelling groundwater, small feeder streams, or water released from deep reservoirs. These refuges allow trout to avoid or recover from potentially fatal levels of heat stress. You can help by taking the following precautions during your warm weather fishing trips. 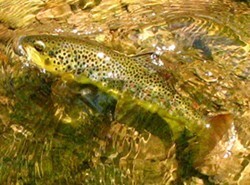 Avoid catch and release fishing for heat stressed trout. Trout already weakened by heat stress are at risk of death no matter how carefully they are handled. Don’t disturb trout where they have gathered in unusually high numbers. Because these fish are likely to be suffering from heat stress and seeking relief, responsible anglers will not take unfair advantage of their distress. Fish Early. Stream temperatures are at their coolest in the early morning. Go to Plan B! Have an alternate fishing plan ready in case water temperatures are too high at your intended destination. Consider fishing a waterbody that is less prone to heat stress or fishing for a more heat tolerant species like smallmouth bass. When fishing tailwaters, such as those below New York City water supply reservoirs, remember that the cooling influence of reservoir releases will not extend as far downstream during periods of intense heat. By paying attention to water temperatures and adapting fishing strategies to changing conditions, anglers can help New York State’s trout and salmon beat the heat. Only you can prevent aquatic invasions. Clean, Drain and Dry your fishing and boating equipment after every use.